Made by real-life trials riders, PEDAL UP! is an insanely addictive bike trials balance game that's fun to play and crazy hard to master. 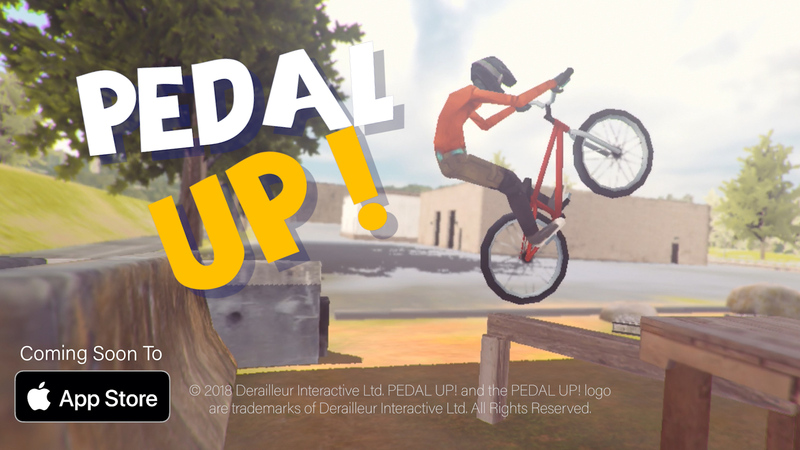 9th October, 2018 - Vancouver, Canada: Canadian developer Derailleur Interactive is proud to announce their new 3D physics-based bike trials game PEDAL UP!, it's set to release on the Apple App Store by end of 2018/early 2019, Android to follow after. Inspired by the extreme sport of bike trials, PEDAL UP! gives you the chance to try back wheel hops, nose-wheelies, bunny-hops, and many more tricks. Players are free to use their skills, balance and creativity to navigate any obstacle in their own way. PEDAL UP! features an advanced Camera Mode to record and share memorable tricks and painful crashes. Intuitive controls and flexible gameplay styles really set PEDAL UP! apart. It’s surprising how simple and fun it is to attempt real life trials moves in the game. There hasn’t been a bike trials game quite like this before. Far away from the photographers and announcers, players begin honing their skills at the local trials park before taking on expert-level competition tracks. At launch PEDAL UP! will release with 40 tracks, it’ll be free to download and play. Players can earn or purchase in-game credits to unlock new Tracks and Challenges such as Time Trials, Trick Challenges and others. Players can compete with their friends on the leaderboards and show off in-game captures of their best moves. Fun and challenging, perfect for riders and trials fans of all ages.